Accidental catheter dislodgement of IV catheters is an ongoing problem — even when catheter stabilization devices are used. The Orchid Safety Release Valve (SRV) is designed to prevent dislodgement. Orchid SRV attaches to the luer between the extension set and IV administration set. When a sudden force is applied to the line, the valve breaks away and seals off both sides of the line. To restart the flow of fluids, simply attach a new, sterile Orchid SRV to the line. *Linear Health Sciences is currently pursuing FDA clearance for the device. The average IV restart can cost around $30. Save the cost by saving the line — with the Orchid SRV. 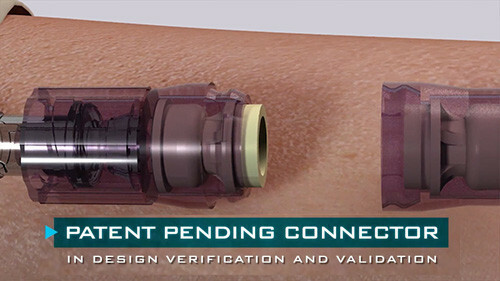 At Linear Health Sciences, we know IV dislodgement and unwanted disconnection of medical tubing is painful, dangerous, and expensive. This is why we develop innovative, mission-critical solutions that grant medical facilities fewer unscheduled restarts while improving patient satisfaction and reducing overall costs. Because of the pivotal role we play in your business, Linear Health Sciences is committed to creating and maintaining strong relationships with our customers, built on a foundation of excellence and trust. From the innovative breakaway valve solutions for IV dislodgement we manufacture to our dedicated customer service and support, we focus what’s important to you. Medtech Innovator: Linear Health Sciences was selected as a semi-finalist for the Medtech Innovator 2016 competition and was awarded a scholarship to the Virtual Accelerator program. ANGEL MD: Angel MD, the largest network of medical startups in the world, has singled out Linear Health Sciences as a #FeatureStartup. Global Center for Medical Innovation: The Southeast’s first and only comprehensive medical device innovation center, dedicated to accelerating development, building businesses and improving health. 2016 Innovator of the Year: Linear Health Sciences was selected as a finalist for the Journal Record’s 2016 Innovator of the Year award, given to outstanding Oklahoma-based companies. medGadget: medGadget, a leading medical technology publication, highlighted Linear Health Sciences in this article.